Participatory Internet developed by Green Communications or Green PI is a new generation of Internet infrastructure that makes networks densification easy, affordable and energy efficient. WHAT IS GREEN PI ? 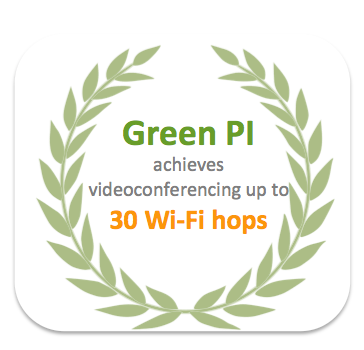 Green PI is a plug and play Internet infrastructure anyone can deploy where connectivity is needed. Participatory Internet does not require any cabling nor civil engineering operations. Green PI tiny routers (YOI) connect automatically to form a wireless network. Once a Participatory Internet is on, people and connected machines enjoy a fast and robust connection to share calls, videos and data. Users have an immediate access to the information and services available around them through Green PI’s local portal. The setting of a simple gateway to the Internet will also provide them with an access to the World Wide Web. Green PI uses embedded or wearable routers named YOI (Your Own Internet). YOIs connect with each other using an advanced device-to-device technology (D2D) to create a scalable wireless network. Green Communications’ patented routing software (GreenSoft) then provides a robust and self-configuring connection able to transfer video, calls and data in static as well as dynamic environment. Thanks to its property of self-organizing wireless system, Green PI removes the expensive cabling and engineering operations of new Internet infrastructure deployment to make network densification fast, easy and affordable. YOIs embed a full TCP/IP environment, an open operating system and a sharing storage. Hence, it is possible to host programs, applications, and services directly at the edge of the network instead of using distant servers. Hosted programs, applications and services are therefore available anytime and autonomous from any external supervision or Internet connection. Local-based services are also fast and energy saving as they are stored close to the end user instead of remote datacenters. Router’s power consumption is minimum so that one can operate a Participatory Internet in all types of environments (fixed, embedded, wearable). The Start&Stop (SaS℗) functionality turns on and off routers automatically according to the needs of the network. No centralized supervision is required: each YOI decides whether it needs to be active or not, with the guarantee that its decision will not impinge on the overall quality of service. SaS℗ provides an effective way to save energy without affecting the global performance of the system. Green PI is an open technology. The system administrators can use SSH or serial connections to access an interactive shell on their devices, and operate them like any regular Linux system. Our products also provide network administrators and application developers with the raw network data, using standard protocols, so they can personalize the platform or build new applications and services. Green PI technology is the result of 10 years of research and development and a technology transfer from best French universities. Participatory Internet achieves unique performances in terms of robustness and mobility.